In The Case of The Murders Around Alchemy. This time is an investigation about Alchemy by Theseus. 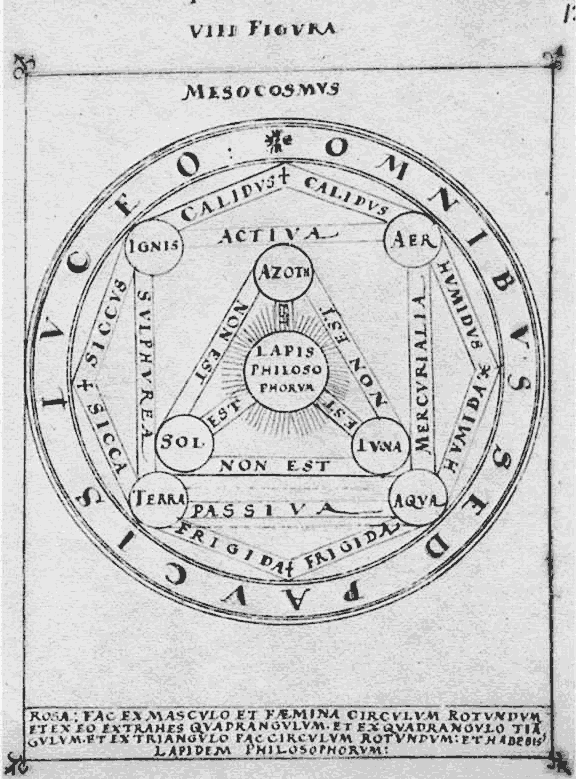 This is one of 8 figures that appear in the alchemy book Sylva philosophorum and written by Cornelius Petraeus in the seventeenth century. This symbol represents the development of the philosopher's stone. Here is the translation of what is written in Latin on this scheme. On the outer circle is written : sed omnibus paucis luceo, ie "for all and yet for some I light" (ie motto). Then the 4 elements are each represented on a square angle : ignis : fire, aer : air, terra : earth and aqua : water. On the octagon are inscribed the qualities of the four elements listed above : calidus, hot, humidus (male) or humida (female), wet, frigida, cold, siccus (male) or sicca, or dry hair. The relationship between the fire and the air is described as activated, active and that between the earth and water as passiva passive. Fire and earth are said sulphurea : sulfuric. As the air and water are said mercurialia : mercurial. There is also a triangle with an inscription in each corner : sol, sun, luna, moon and azoth, an alchemical term for "raw material". Then we read on the lines of the triangle non est : it is not. While the lines that join the center of the image is written est : it is. Finally, there remains that what is central : lapis philosophorum, the stone of the philosophers. hahaha.. philoshoper stone is always interesting..